The UN Security Council (UNSC) unanimously approved a new round of sanctions on the North in December last year, slashing the country’s oil and petroleum imports. 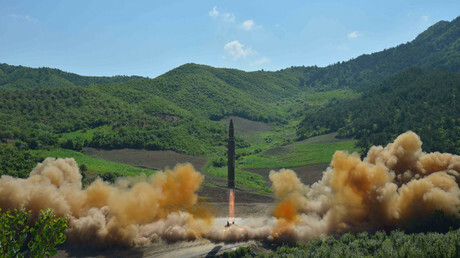 The move was in response to Pyongyang's latest ballistic missile test launch. Beijing is believed to be Pyongyang’s main economic lifeline, accounting for nearly all of the North’s trade and energy supplies. The enhanced sanctions regime led to a 50 percent plunge in China’s trade with North Korea in December. In addition to the existing economic sanctions approved by the 15-member UNSC, Washington has imposed unilateral punitive measures. Such moves have been repeatedly denounced by Moscow which considers it unacceptable in terms of international law. Washington also called on its allies to ramp up pressure on Pyongyang during a summit in Vancouver. The jointly hosted US-Canada meeting in mid-January saw 20 other nations agreeing on further economic sanctions. Russia and China – who were not invited to Vancouver – condemned the move. Russia's Foreign Ministry said the meeting demonstrated “absolute disrespect” for the authority of the UNSC. It added that the meeting failed to offer any alternative to the existing Chinese-Russian initiative, the so-called 'double-freeze' initiative, which calls on Pyongyang to suspend its nuclear tests, with Seoul and Washington halting their joint drills in the region.